Here’s a great gift idea, the Faith Family Friends Candle Sleeve Vanilla. The candle sleeve is made in the USA. 6 watt bulb and the base of your choice (Antique White, Chocolate & Black) are all sold separately on our site. 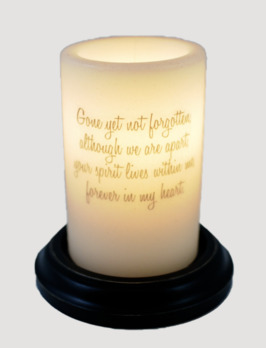 A thoughtful gift idea or to remember a person you miss, The Not Forgotten Candle Sleeve. A timeless gift that will last many years. 6 watt bulb and the base of your choice (Antique White, Chocolate & Black) are all sold separately on our site. A great gift idea or to remember a person you miss, The Someone Love Candle Sleeve. A thoughtful gift that will last many years. 6 watt bulb and the base of your choice (Antique White, Chocolate & Black) are all sold separately on our site.